We also have Austin’s sister, a Black woman/elf/program who they are all eager to rescue: and it’s nice to see both a Black woman being the precious person to save but also a woman being someone to save without her being the love interest to one of the rescuing men. And even as Austin’s sister we’ve also got JT caring just as much about rescuing her. These two are a hot mess, but they’re working through it and it does work. I like them, I like their story, I like their sexiness, I like their contrasts. 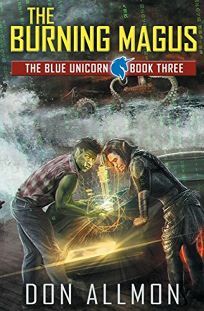 Part of me worries that the Blue Unicorn Series may be completed here - trilogies are the in thing after all, and the long glorious series I love so much are distinctly out of fashion. But there is a lot more to work through here - the world is huge, I want to know where the Blue Unicorn goes from here, JT and Austin have so much more to work through and there’s so much more they could do. Buzz, Comet and definitely Dante all have so much more to tell - let there be more!